One of the food groups the Accidental Locavore follows on LinkedIn had a post about grilling in the winter (easier to do when there’s not a mountain of snow between you and the grill) and a recipe for a Thai rotisserie grilled chicken. Sounded good to me! Since there was too much snow between me and the grill, I pulled out my electric rotisserie and that worked fine. It’s really easy to do, just leave time for marinating the chicken. Since everything was going in the food processor, you don’t have to chop too finely. This is adapted from Jeff’s recipe, mostly because I was using what was in the house. In the work bowl of a food processor, combine all the ingredients, except the chicken, and pulse until you have a fairly fine paste. Place the chicken on a flat surface (a hotel pan works well) and gently loosen the skin around the breast and thighs. Take a small handful of the marinade and rub it into the space you have just created. Put the chicken in a large Ziploc bag, or a covered container big enough to hold it. Add the rest of the marinade, making sure the chicken is well covered with marinade. Seal the bag and refrigerate for at least 4 hours or overnight. An hour before you’re going to cook the chicken, bring it out of the refrigerator, remove from the marinade and allow it to come to room temperature. Depending on how you’re going to cook it, truss the chicken or put it on the spit for your rotisserie. I just plopped it on my electric rotisserie for about an hour until it was 160° in the thickest part of the thigh. Let it rest for about 10 minutes before carving. Serve and enjoy! 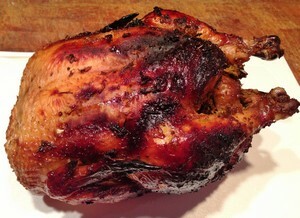 My Verdict: Wonderful, even on the electric rotisserie! For some reason, I’ve never marinated a chicken before putting in on the rotisserie-dummy me! If your grill is submerged, you could always roast the chicken in a 425° oven for about an hour, until the thickest part of the thigh is 160°. Jeff’s recipe called for Thai yellow curry, I thought I had some but didn’t. The massaman curry was great, green or red curry would probably work equally as well. I had a lot of drippings in the base of my rotisserie, which I just put in a small pot and reduced. 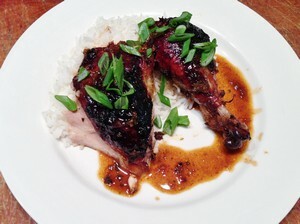 It made an amazing sauce which I served over the chicken and some jasmine rice and garnished with some sliced scallions. This is a recipe that is made for improvisation, so have fun and eat well!